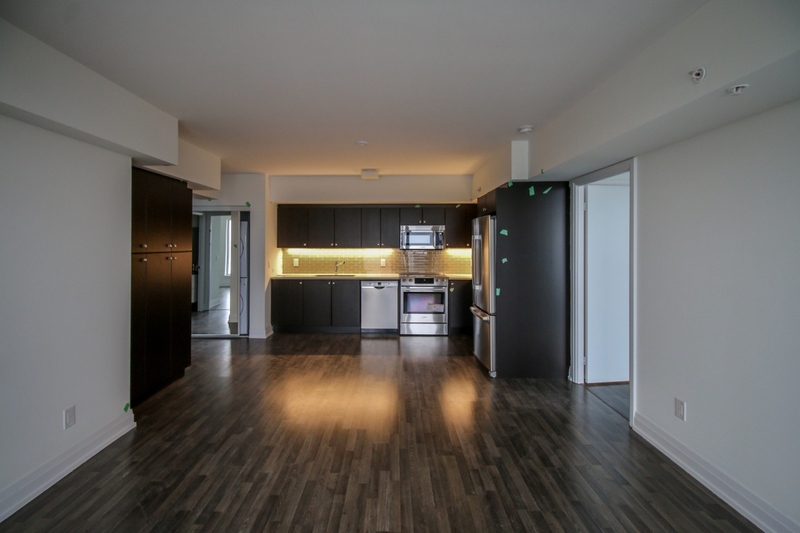 BuzzBuzzHome News dropped by The Station Condos earlier this month for the latest update of our Dig to Done series. We’ve been following the project by Brandy Lane Homes since construction started in 2012 and this time around we’re happy to report that occupancy has officially begun! 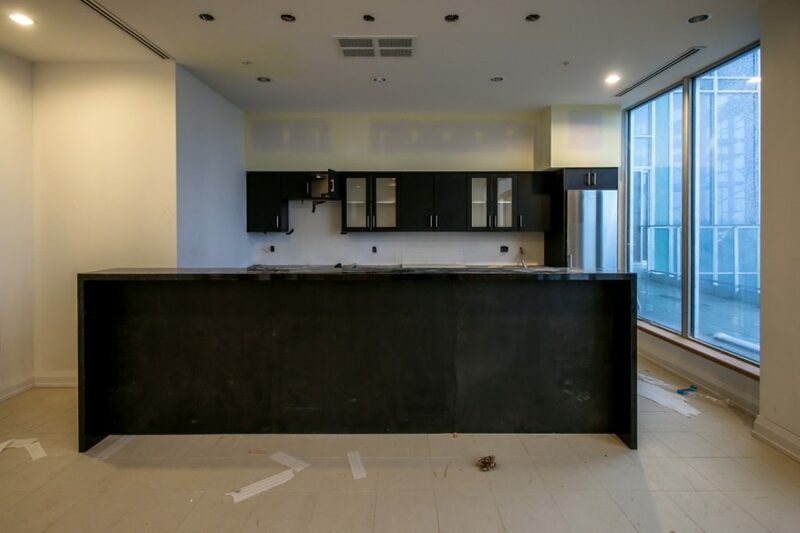 As more homeowners move in, work crews have started to move out with one notable example being the current location of the construction office which is getting prepped to become part of the development’s retail space. 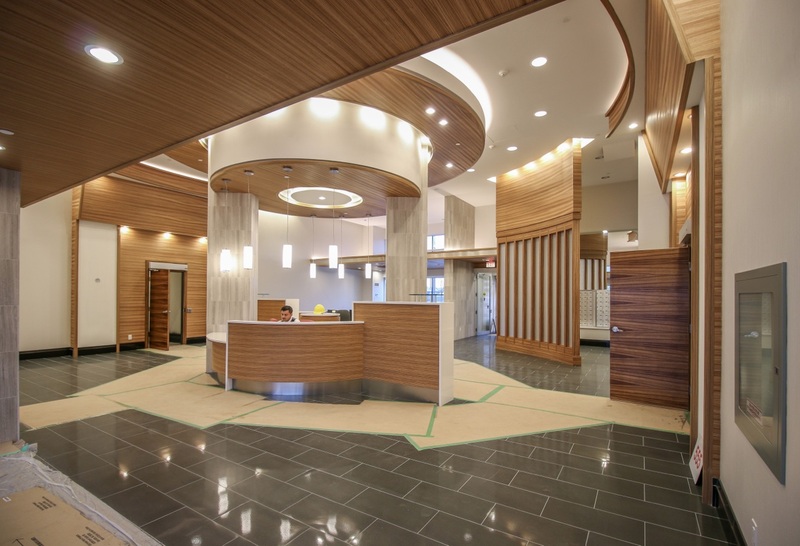 Also on the ground floor, the two-storey, art deco-inspired lobby is looking clean and sharp with the building’s concierge now stationed in the central desk area. Outside the main door, more landscape work has been completed with trees and shrubs planted along the front courtyard and walkway. 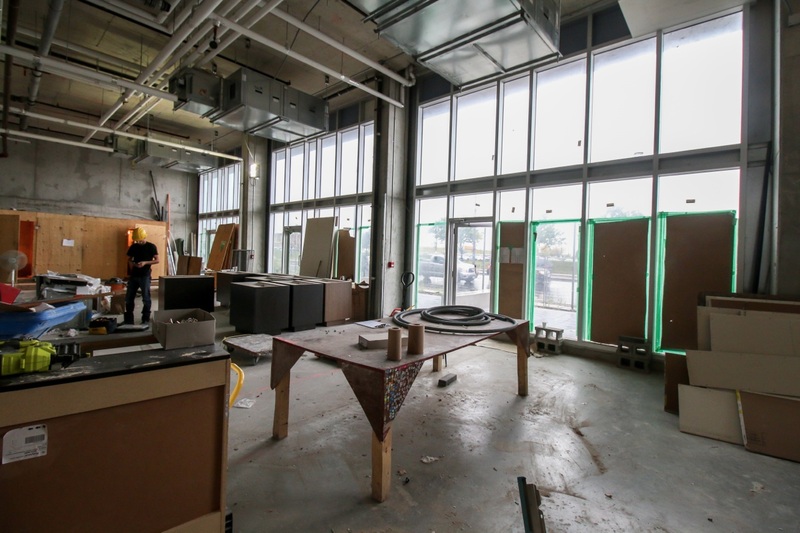 Over on the seventh floor Studio Club, more cabinets have been installed in the Urbana Lounges, padded floors are place in the fitness centre, and more floor and wall tiles have been laid around the infinity pool. 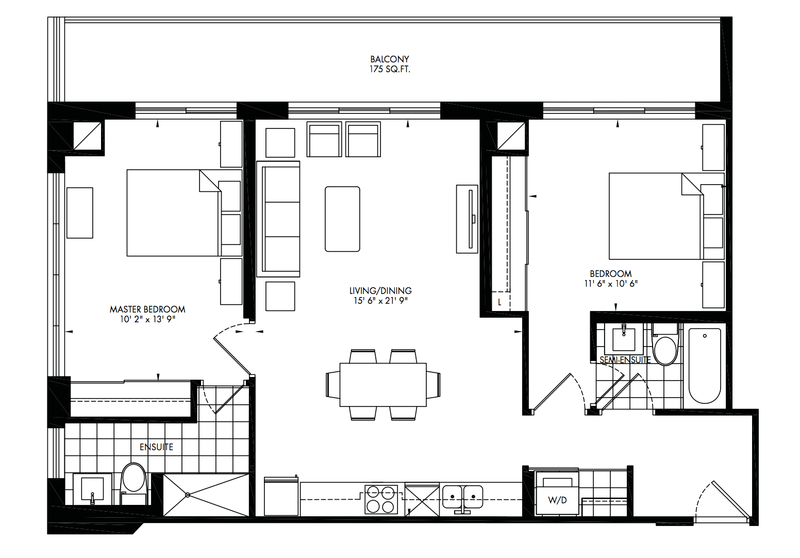 Kitchen cabinets, stainless steel appliances and a cozy gas fireplace have also arrived inside the spacious party room. When fully complete, the amenities level will also feature steam rooms, a games room and an expansive outdoor rooftop terrace. While on site, we also toured one of the C4A style suites — just one of the many choices still available. 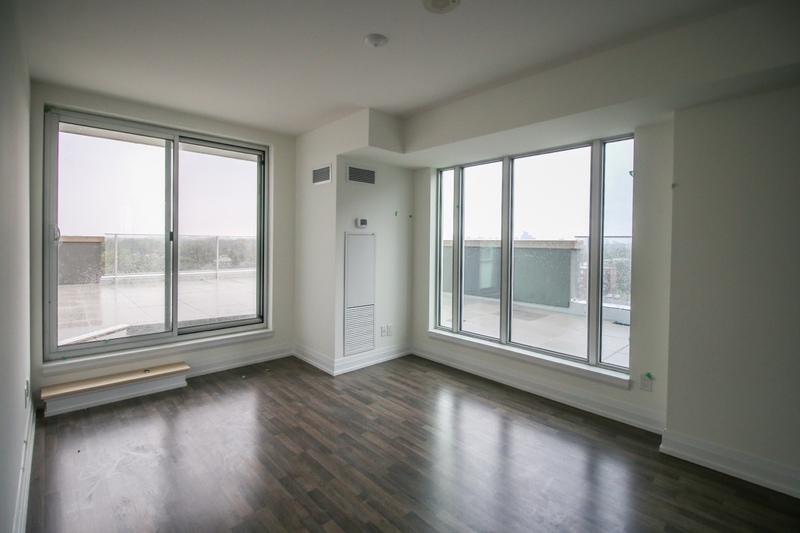 The thoughtfully designed two bedroom corner unit features a total of 1,154 square feet of indoor and outdoor living space. Walking into the suite, you’re greeted with a large foyer with a three-piece bathroom that also acts as an ensuite for the secondary bedroom. The hallway then leads to an open concept kitchen overlooking a large living and dining area with floor-to-ceiling windows and a sliding door that opens to a huge outdoor terrace. The master retreat fills up the other end of the suite with a generous-sized bedroom area with lots of natural light, plenty of closet space and a luxurious ensuite with a stand-up shower. All of the suites at The Station feature modern finishes like engineered laminate floors, contemporary bathrooms with ceramic wall tiles and European-inspired kitchens with granite countertops and a stainless steel appliance package. A select collection of suites is still available with quick occupancy so make sure to register online or visit the sales centre on Tippett Road open Monday to Wednesday from 12pm to 6pm and weekends from 12pm to 5pm. 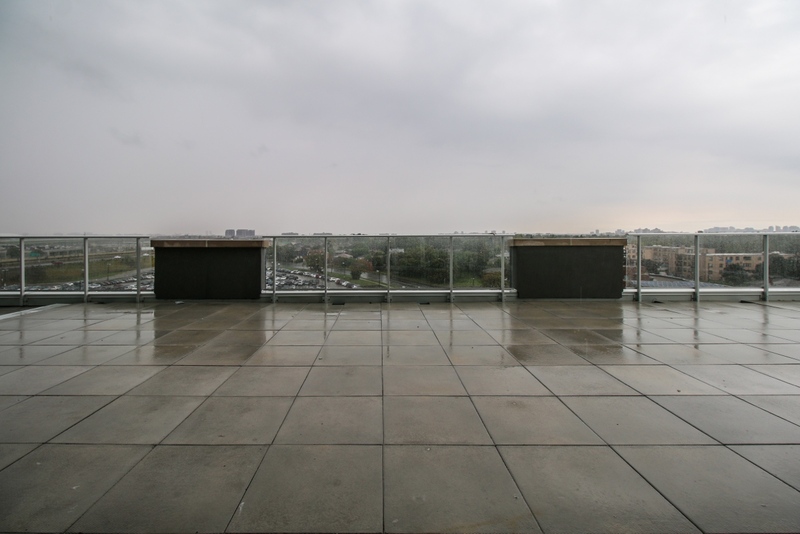 For more information on The Station, please call 416 398 9777 or visit thestationcondos.com.